The following query will list out the foreign keys in mysql. It finds it out from the information_schema database. Basically the key_column_usage table contains information about all keys in all available databases. So it can be queried in any way to get the desired information. Another way would be to show the table structure. 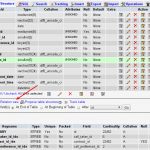 It displays the sql query to create the table and has the foreign key constraints too. The "Relation View" in phpmyadmin shows all the foreign key constraints. The show create table command is great.. too bad describe [table] doesn’t provide more information about keys and such. Thank you, I’ve tried the first solution and it worked perfectly. Thanks a lot!!! Super!!! Finally someone posted a real solution. It doesn’t work. Because the referenced_table_name IS NULL. Is this a MySQL bug ? Can your provide the schema definition ?